"Ultralight" redirects here. For the style of backpacking, see Ultralight backpacking. Ultralight aviation (called microlight aviation in some countries) is the flying of lightweight, 1- or 2-seat fixed-wing aircraft. Some countries differentiate between weight-shift control and conventional 3-axis control aircraft with ailerons, elevator and rudder, calling the former "microlight" and the latter "ultralight". During the late 1970s and early 1980s, mostly stimulated by the hang gliding movement, many people sought affordable powered flight. As a result, many aviation authorities set up definitions of lightweight, slow-flying aeroplanes that could be subject to minimum regulations. 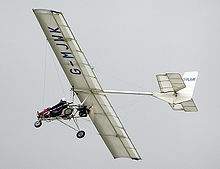 The resulting aeroplanes are commonly called "ultralight aircraft" or "microlights", although the weight and speed limits differ from country to country. In Europe, the sporting (FAI) definition limits the maximum take-off weight to 450 kg (992 lb) (472.5 kg (1,042 lb) if a ballistic parachute is installed) and a maximum stalling speed of 65 km/h (40 mph). The definition means that the aircraft has a slow landing speed and short landing roll in the event of an engine failure. In most affluent countries, microlights or ultralight aircraft now account for a significant percentage of the global civilian-owned aircraft. For instance in Canada in February 2018, the ultralight aircraft fleet made up to 20.4% of the total civilian aircraft registered. 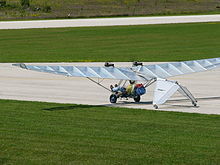 In other countries that do not register ultralight aircraft, like the United States, it is unknown what proportion of the total fleet they make up. In countries where there is no specific extra regulation, ultralights are considered regular aircraft and subject to certification requirements for both aircraft and pilot. Daylight, minimum of 500 ft (152 m). certificate exam, insurance and a medical examination. requires a helmet only for open cockpit aircraft. flying over populated areas and people asseblyes is prohibited. Flyable area: uncontrolled airspace over unpopulated areas, within 3 km from departure point and landing at another point forbidden. United Kingdom Sub-70kg Unregulated, Single Seat De-Regulated, Two seat Regulated. 1–2 Several definitions, from 70kg empty weight to 472.5kg maximum weight at take-off Daytime VFR Licence not required for sub 70kg empty weight, else NPPL licence required Recreational. No paid work. United States ultralight aircraft 1 155 lb (70 kg) for unpowered, with extra weight allowed for amphibious landing gear and ballistic parachute systems daylight hours no license required less than 5 US gallons (19 L) fuel capacity, empty weight of less than 254 pounds (115 kg), a top speed of 55 knots (102 km/h or 64 mph), and a maximum stall speed not exceeding 24 knots (45 km/h or 27.6 mph). May only be flown over unpopulated areas. In Australia, ultralight aircraft and their pilots can either be registered with the Hang Gliding Federation of Australia (HGFA) or Recreational Aviation Australia (RA Aus). In all cases, except for privately built single seat ultralight aeroplanes, microlight aircraft or trikes are regulated by the Civil Aviation Regulations. Paramotor and powered hang-glider pilots (including those flying aircraft with wheels) do not need a licence, provided the weight of the aircraft is not more than 75 kg (165 lb), but they must obey the rules of the air. For heavier microlights the current UK regulations match the European ones, except that helicopters and gyroplanes are not included. Earlier UK microlight definitions described an aeroplane with a maximum weight of (finally) 390 kg (860 lb), and a maximum wing loading of 25 kg (55 lb) per square metre. Other than the very earliest aircraft, all two-seat UK microlights (and until 2007 all single-seaters) have been required to meet an airworthiness standard; BCAR Section S. In 2007, Single Seat DeRegulated (SSDR), a sub-category of single seat aircraft was introduced, allowing owners more freedom for modification and experiments. By 2017 the airworthiness of all single seat microlights became solely the responsibility of the user, but pilots must hold a microlight licence; currently NPPL(M) (National Private Pilots Licence). Ultralights in New Zealand are subject to NZCAA General Aviation regulations with microlight specific variations as described in Part 103 and AC103. The United States FAA's definition of an ultralight is significantly different from that in most other countries and can lead to some confusion when discussing the topic. The governing regulation in the United States is FAR 103 Ultralight Vehicles. In 2004, the FAA introduced the "Light-sport aircraft" category, which resembles some other countries' microlight categories. Ultralight aviation is represented by the United States Ultralight Association (USUA), which acts as the US aeroclub representative to the Fédération Aéronautique Internationale. Fixed-wing aircraft: traditional airplane-style designs. 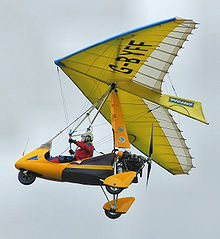 Weight-shift control trike: use a hang glider-style wing, below which is suspended a three-wheeled carriage which carries the engine and aviators. These aircraft are controlled by pushing against a horizontal control bar in roughly the same way as a hang glider pilot flies. Powered parachute: fuselage-mounted engines with parafoil wings, which are wheeled aircraft. Powered paraglider: backpack engines with parafoil wings, which are foot-launched. Powered hang glider: motorized foot-launched hang glider harness. Autogyro: rotary wing with fuselage-mounted engine, a gyrocopter is different from a helicopter in that the rotating wing is not powered, the engine provides forward thrust and the airflow through the rotary blades causes them to autorotate or "spin up" thereby creating lift. Helicopter: there are a number of single-seat and two-place helicopters which fall under the microlight categories in countries such as New Zealand. However, few helicopter designs fall within the more restrictive ultralight category defined in the United States of America. Hot air balloon: there are numerous ultralight hot air balloons in the US, and several more have been built and flown in France and Australia in recent years. Some ultralight hot air balloons are hopper balloons, while others are regular hot air balloons that carry passengers in a basket. Advancements in batteries, motors, and motor controllers has led to some practical production electric propulsion systems for some ultralight applications. In many ways, ultralights are a good application for electric power as some models are capable of flying with low power, which allows longer duration flights on battery power. In 2007, the first pioneering company in this field, the Electric Aircraft Corporation, began offering engine kits to convert ultralight weight shift trikes to electric power. The 18 hp motor weighs 26 lb (12 kg) and an efficiency of 90% is claimed by designer Randall Fishman. The battery consists of a lithium-polymer battery pack of 5.6kWh which provides 1.5 hours of flying in the trike application. The company claimed a flight recharge cost of 60 cents in 2007. 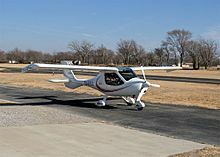 A significant obstacle to the adoption of electric propulsion for ultralights in the U.S. is the weight of the battery, which is considered part of the empty weight of the aircraft despite efforts to have it considered as fuel. As battery energy density improves lighter batteries can be used. ^ Transport Canada (February 2018). "Canadian Civil Aircraft Register: Number of Aircraft by Category Result". Retrieved 20 March 2018. ^ Kiehn, Chris (15 July 2013). "Synopsis: the Light Sport Aircraft category". Archived from the original on 19 August 2006. Retrieved 12 July 2013. ^ "RBHA 103A regulation, in Portuguese" (PDF). Archived from the original (PDF) on 29 January 2011. Retrieved 21 September 2009. ^ Transport Canada (30 December 2007). "Canadian Aviation Regulations, Part I - General Provisions, Subpart 1 - Interpretation". Retrieved 22 March 2009. ^ Microlight Aviation (2008). "Microlight/ultralight FAQs". Archived from the original on 5 January 2015. Retrieved 17 July 2008. ^ "Laws and regulations on ultralight aviation in Italy" (in Italian). 2011. Retrieved 2 March 2011. ^ "Presidential decree 9 July 2010, n.133" (PDF) (in Italian). 2011. Retrieved 2 March 2011. ^ a b c "航空：超軽量動力機とは - 国土交通省". www.mlit.go.jp. Retrieved 2019-01-27. ^ a b c d e f "サーキュラー No.1-007 超軽量動力機又はジャイロプレーンに関する試験飛行等の許可について" (PDF). 航空：超軽量動力機等の安全確保について - 国土交通省. 2015-03-20. ^ a b c d "超軽量動力機等に関する航空法第28条第３項の許可の手続き等について" (PDF). 航空：超軽量動力機等の安全確保について - 国土交通省. 2007-09-03. ^ a b c d "航空：超軽量動力機等の安全確保について - 国土交通省". www.mlit.go.jp. Retrieved 2019-01-27. ^ a b c "航空法 / Civil Aeronautics Act". 日本法令外国語訳データベースシステム Japanese Law Translation. 2009-04-01. ^ Angeles City Flying Club, Excerpt from part 11 of the Civil Aviation Regulations. ^ Civil Aviation Authority Philippines Archived 2009-04-22 at the Wayback Machine, download page for all regulations. ^ "The British Microlight Aircraft Association, new page 3786". www.bmaa.org. Retrieved 21 May 2018. ^ Federal Aviation Administration (January 2007). "Title 14: Aeronautics and Space, Part 103 - Ultralight Vehicles". Archived from the original on 19 January 2011. Retrieved 4 February 2011. 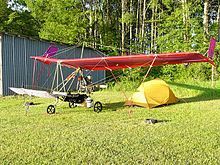 ^ United States Ultralight Association (2009). "Frequently asked Questions". Retrieved 4 February 2011. ^ Hang Gliding Federation of Australia (n.d.). "The HGFA". Retrieved 25 May 2008. ^ Recreational Aviation Australia Inc (August 2007). "About the RA-Aus association and our mission". Archived from the original on 19 May 2008. Retrieved 25 May 2008. ^ Legal Services Group Civil Aviation Safety Authority (July 2007). "PART 200 Aircraft to which CASR do not apply". Retrieved 25 May 2008. ^ "The British Microlight Aircraft Association, new page 3852". www.bmaa.org. Retrieved 21 May 2018. ^ a b Grady, Mary (April 2008). "Electraflyer Flies Trike, Motorglider On Battery Power". Retrieved 13 April 2008. ^ Electric Aircraft Corporation (2007). "ElectraFlyer Technical details". Archived from the original on 16 October 2007. Retrieved 13 April 2008. ^ "Experimenter - February 2013". epubxp.com. Retrieved 16 August 2015. This page was last edited on 23 March 2019, at 18:30 (UTC).